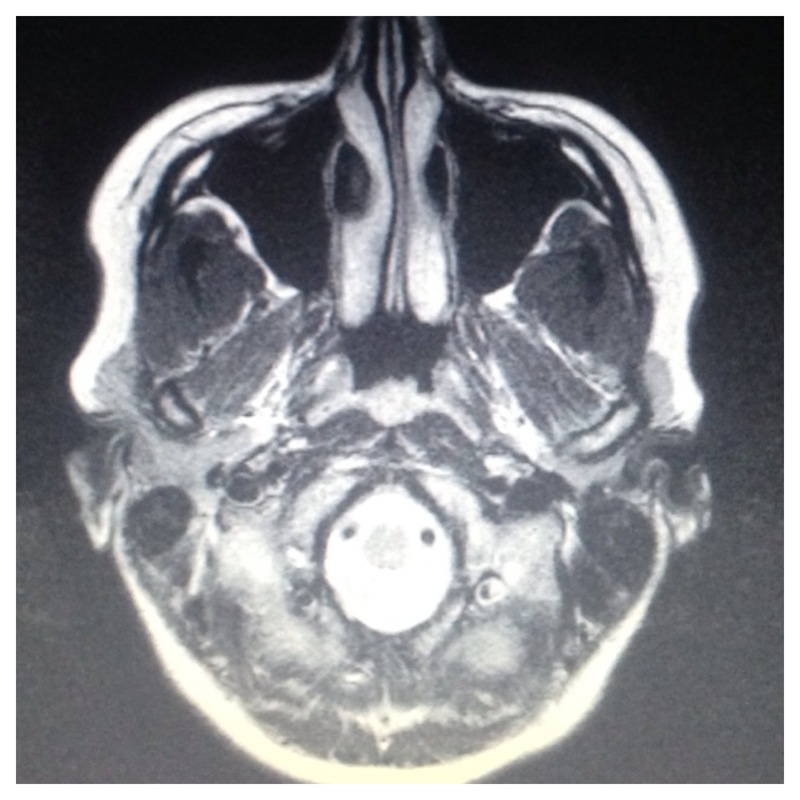 I had my yearly MRI 2 weeks ago and didn’t expect that – NO new lesions! My April relapse must have been triggered by existing lesions as there is still quite some activity. But yeah, this is good news and considered the limited drug choice, I will stay on Rebif for now until Tecfidera is available in The Netherlands. I can’t wait for an oral drug as the injecting business is a pain at times. Not to mention the bruises, it didn’t get any better in the past year. 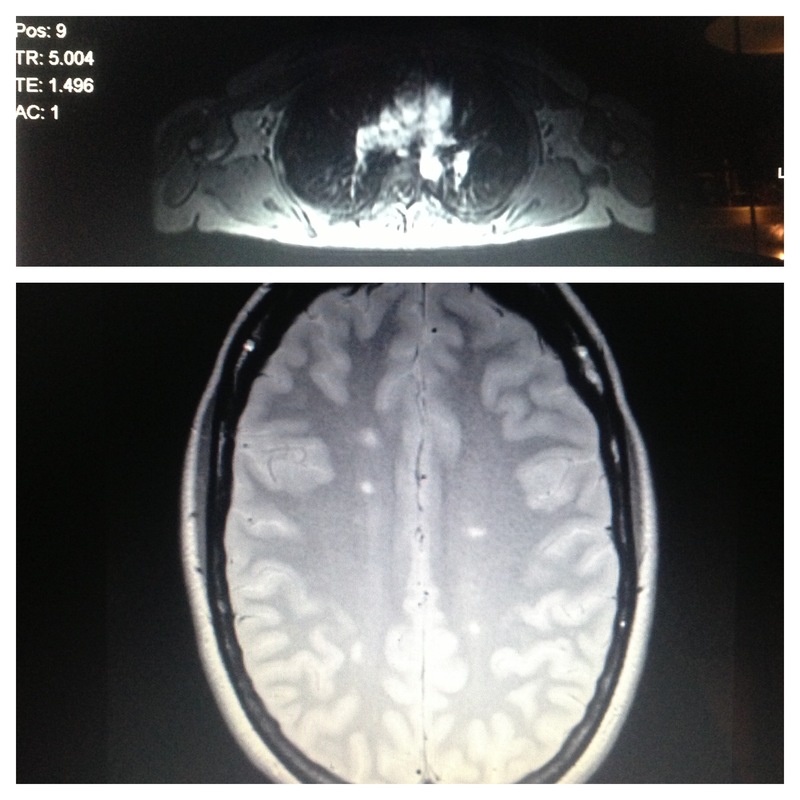 The not so good news – my C2 spinal cord lesion (picture above, the very top one. The white spot is my lesion and the black surrounding it is my pretty spinal cord). Trouble maker. As you can see in the MRI image, that lesion blocks about 1/3 of my spinal cord and causes most of my MS symptoms like the numbness,paresthesia, muscle weakness and pain. And so on. It’s basically a nerve traffic jam as my brain doesn’t receive the full information needed at the same time. Luckily I got only one spinal cord lesion so far and it didn’t grow, but you can imagine what happens if there are more or larger ones. If this lesion would block it completely, I’d be paralyzed from the neck down. The spinal cord is very tricky but unfortunately not as clever as the brain. Our brain has the fabulous ability to find new connective routes to a certain degree. I really needed to hear “I don’t think it will improve” and that’s exactly what I got. Why? Sometimes, bad news can feel like a relief. It was the same when I heard that I have MS. Finally some facts, something you can work on and learn to life with. Adapt. Overcome. New on my health team is Roel, my physiotherapist who will help me to build up strength. There is daily “homework” required ( lifting weights to strengthen my forearm muscles etc) so I decided to order some dumbbells and a thicker fitness mat. I can’t practice with wine bottles as he recommended forever 🙂 Great excuse for shopping, loving the new Reebok line. My birthday present to myself! Anja, I have a million questions.Why did your neurologist say that? That you should not expect to get better…that’s what remission! I’ll give him the benefit of the doubt (I don’t know why) until you let me know what he said. My first thought is that he’s an a$$h@le! I’ve had RRMS for 20 years. You are doing all the right things, except not filtering out the garbage. This is a journey and that is all it is. Many ups and downs, but hey…that’s life for everybody. Be patient with your body and stop studying your lesions so much. It doesn’t help to be sooo on top of them. It doesn’t help because they are so unpredictable. They could be there forever and not do a thing. They will change. There’s too much uncertainty. You’ll just freak yourself out, and that’s the worst thing. Stop. I’m no expert, but, I’ve been at this for a long time. You don’t want to go down the “rabbit hole”. Check my blog out. I would love to stay in touch. I totally agree with Estizer on this one… there is a lot known about MS, but there’s so much still that is unknown. How is he sure that there’s no chance for improvement? I doubt that any of us will improve 100%, but I’ve seen great improvements in my balance (even from *before* my dx) since I’ve known how to focus my workouts. I think that many doctors are ignorant and uneducated… in the 11 months since my dx, I’ve already changed specialists once.